Radiology (commonly called taking x-rays) is used to diagnose bone, joint, heart, lung, spinal, urinary, liver, and many other diseases. Situations in which we regularly radiograph an animal include trauma, such as hit-by-car, falls, fight, possible fractures, suspected ingested foreign bodies, cancer, pregnancy, or lameness. 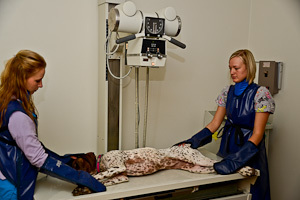 Depending on the body part bring radiographed, sedation may be required to get diagnostic films. Our new digital radiology equipment allows us the ability to take radiographs in just seconds and adjust any setting digitally with the click of the mouse for outstanding quality views. Using our iPad, we can easily show you the radiographs in the exam room. When needed, just like in human medicine, we are able to send radiographs digitally to board certified radiology specialists for further interpretation. 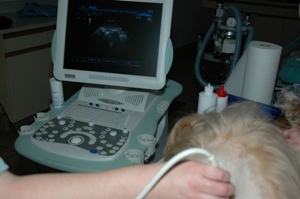 An ultrasound is a non-invasive imaging procedure that enables an in-depth view of your pet's organs. It utilizes sound waves to form a medical image of you pet's internal organs and is used in conjunction with radiography (x-rays) and other diagnostic procedures. Anesthesia or sedation is usually not necessary to perform an ultrasound. We use ultrasound to check for pregnancy, look at the liver, gallbladder, kidneys, adrenal glands, spleen, stomach, pancreas, intestine, bladder, and other organs. We may find the organs to be smaller, larger, or with increased or decreased density. We can see fluid such as blood or serum in body cavities or inside organs. Cancer or tumors are often found with ultrasound that are not evident by other routine testing.